Our lives are often so busy that when we experience physical symptoms it’s often the last resort to make us listen to what is going on at all different levels. In Lomi Lomi we work on the physical body, healing, aligning and balancing the body and through that, all levels are affected. Lomi Lomi is an ancient Hawaiian healing art. The Hawaiians see all aspects of the body, the physical, mental, emotional and spiritual as part of our whole self. 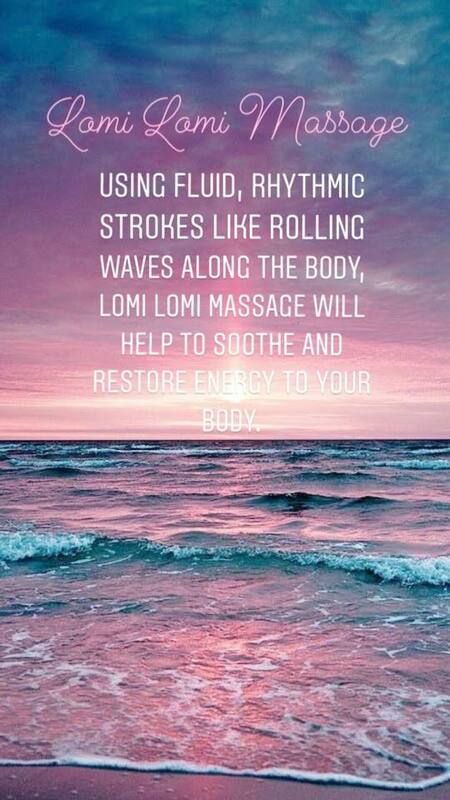 Lomi Lomi is so much more than a massage. To me, it’s a gigantic hug. Nourishing scrumptious and deeply healing. This treatment incorporates rhythmic movements and long forearm strokes to realign the body, improve circulation and induce overall well-being. This advanced treatment focuses on specific areas of concern, such as but not exclusively shoulder & neck, back and knee pain. This treatment will bring immediate relief with lasting benefits to these areas of concern. We follow symptoms to their source and heal the body at a deep and holistic level.